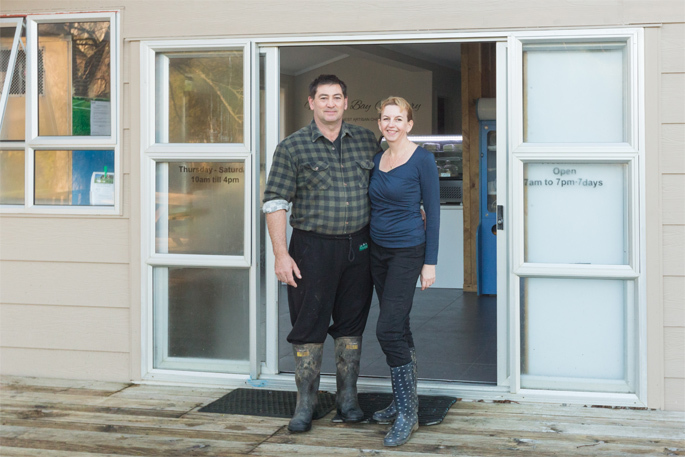 Carl and Jeanette Storey, on the doorstep of their Mercury Bay Creamery store. Small batches and fresh milk are the secret to success at Mercury Bay Creamery. “It all starts with the cows and farm,” says Carl Storey, whose journey to becoming a cheesemaker began during his OE to Europe in the 1990s. While overseas, Carl mostly supported himself with construction industry work, and towards the end of his travels “fell into” a job with a French cheesemaker, where he stayed for about 18 months learning the art of making cheese. The love of cheesemaking followed Carl back to New Zealand, where he made cheese for friends and family in his spare time. It wasn’t until three years ago, when Carl and wife Jeanette purchased the Mercury Bay farm, that Carl’s dream to become a professional a cheese maker came to fruition. All Mercury Bay Creamery cheese is created solely from milk produced on their farm. The 20-cow Aryshire herd was sourced from the Waikato, and Ayrshires were chosen because they have a better fat-to-protein ratio which makes the best cheese, explains Carl. Carl, who grew up on a dairy farm, milks cows in a small single-side herringbone shed, with five sets of cups, which he built. Six or seven cows are milked through winter to maintain milk supply. The farm is part of the Mercury Bay Creamery story, and customers drive past the cows on their way up the drive to the on-farm retail shop, and that’s important, says Carl. “It’s true artisan production. It’s our cows, our milk and your cheese,” says Carl. The small Ayrshire herd produces enough milk to make around 2500kg of cheese annually. Milk that isn’t used in cheese production is sold at the farmgate to those wanting fresh raw milk. The retail shop is currently the only outlet for cheese, but there has been interest from local restaurants, says Carl. With around 55,000 people driving past their gate – which is 1.5km south of popular tourist destination, Whitianga – every year, the small retail shop is always busy. And while Mercury Bay Creamery has been open since April, it was a few years in the planning – and there is a lot of trial and error involved, says Carl. The Aryshire breed of cattle was historically called the ‘Dunlop cow’, so making Dunlop is a natural fit for Mercury Bay Creamery. “Getting the mix of cheeses right is something we’re learning as we go,” says Carl. At the moment Carl is the only employee of Mercury Bay Creamery, but next year, wife Jeannette, is expected to join the team full-time. She currently works as a teacher at a nearby school and fits in cheesemaking and farm around her teaching role.